You have probably heard about Innoson in different mediums and instances, but what do you really know about IVM? What do you know about the manufacturing of motor vehicles?During the Techpoint Tours, Mr. Nnamdi Onusogu the General Manager of Innoson Nigeria Limited led us on a guided tour of the Innoson vehicle manufacturing facility.Located in Uru Umudim in Nnewi, Anambra State, the plant is a wonder in itself. We took a pictorial tour of the facility and documented an abbreviated version of the vehicle manufacturing process. This particular welding section is for smaller buses and pickup trucks. Here, sheet metals are bent and folded, filed, then cut up to size with appropriate dimensions. After the sheet metal is processed, they are placed on a jig and held down with clamps firmly. There is the parent jig that can accommodate the car’s whole frame, then there’s a side jig for the different sides of the bus. When placed on the jig, a Spot Welding machine pieces the sheet metals together with sparks to mould the car frame. A Spot Welder is preferred over the basic welding machine for this because it does cleaner work. During the welding process, a MIG Welder is used to reach nooks and crannies the Spot Welder can’t reach. After filing an overhead crane picks the now smoothened car frame and dips it into an extra large vat of Astro Coat — a water-based, acrylic, ablative coating with excellent fire, water, air permeability properties — to avoid rusting. From the oven, it moves to the painting section where a maxer and sealant is applied. After this, a primer is applied so paint can go on smoother and last longer on the car frame. This primer is also a second anti-rust treatment, then the frame is put back in the oven and baked a second time.After the priming, deflections, holes and dents are spotted and fillers are used to cover them. Painting is done in a booth to avoid dust particles being trapped under paint surfaces. Then there’s an engine assembly department where engines are coupled. I asked Ekene how long all these processes took on an average. He did not know. Painting booths are also bigger for big buses. For bigger vehicles, carcass and chassis are dropped with an overhead crane and assembled atop a mechanics pit to access engine area. 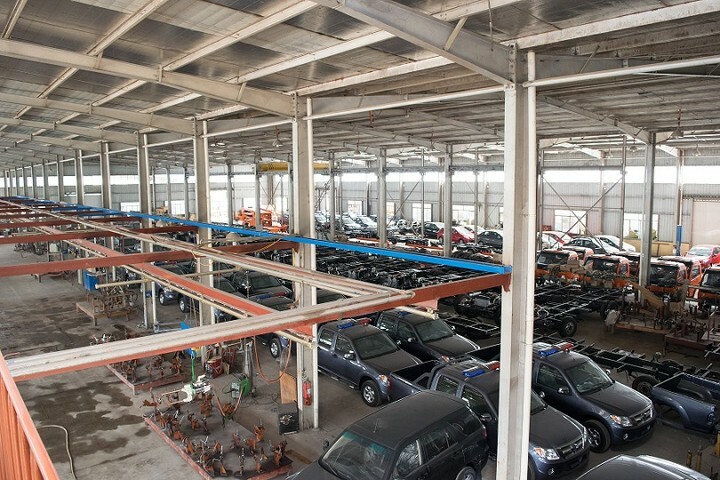 Vehicles like the IVM Jeeps that their chassis are together with the body are moved through a conveyor on top of the production line so workers can access underneath to fix parts and necessary fittings onto the chassis. Once the vehicle leaves its final conveyor journey, it comes to the alignment section for proper balancing of wheels. In QC, it is first taken for a rain test. After rain test, quality control still checks that the vehicle conforms to general standards like airbags, seatbelts, and rear view mirrors. And also conform to Innoson standards like making sure sensors and minor modifications work perfectly.